The Vatican is performing contortions with the word "martyr" in order to fast-track Pope John Paul to sainthood. 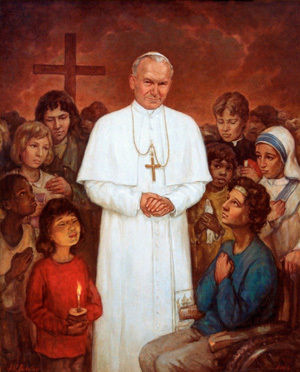 ROME (AP) — Vatican officials no longer are dismissing outright the notion that Pope John Paul II could be declared a martyr, a step that could remove the need for a confirmed miracle to beatify the late pontiff and make it easier for him to become a saint. The word "martyr" means "witness," and in its original use, it didn't require death for the faith at all. Still, over the centuries, the word has come to mean people who have died specifically because they would not reject the faith. And that's how the Catholic Church ordinarily defines the word, or it wouldn't have to be redefining a long illness as "martyrdom." The Vatican would still need to confirm that a miracle occurred after his beatification for John Paul to be declared a saint. Church officials had initially rejected outright any suggestion that the 1981 assassination attempt could be the basis for a martyrdom declaration since John Paul lived for almost another 24 years. They also noted that other candidates for beatification and sainthood had also suffered ordinary illnesses at the end of their lives but were not declared martyrs. However, Cardinal Camillo Ruini appeared to have been setting the stage for a possible martyrdom declaration Tuesday when he formally opened the beatification cause for John Paul. During his remarks at the end of the service, Ruini said there was a "decisive" link between John Paul and Jesus Christ based on blood. "John Paul truly spilled his blood in St. Peter's Square on May 13, 1981, and then again, not just his blood but he offered his life during the long years of his illness," Ruini said. the Orthodox Church, we have other categories — "confessors" who suffered greatly but did not die (St. Maximos the Confessor had his tongue cut out and his right hand cut off to stop his message) and "passion-bearers" who died as a result of the depredations of unbelievers, but not specifically for the faith (the Russian Orthodox Church has proclaimed the last Tsars' family passion-bearers). I'm not as familiar with Catholic nomenclature, but I don't believe Catholics have these categories. Pope John Paul wouldn't fit into them either. The problem is that the Catholic Church has to have verifiable miracles in order to canonize someone. That seems to this outsider to be an unnecessarily rigid restriction. What if God just didn't need to go outside the ordinary course of things to show his work in a saint's life? What if a person lives every day saying yes to God in ordinary ways and inspiring people with God's love, life, holiness, and truth? If Pope John Paul had been an Orthodox patriarch, with the kind of love that he engendered, he would be well on his way to sainthood now (of course, we don't have a Vatican to prove anything to). It would start in the parishes and in the parishioners' prayer corners, and there would be an upswelling of devotion that the bishops wouldn't be able to ignore. The bishops would address the question at a synod and decide that, yes, the local Church would venerate him publicly. Then icons would be written -- or halos painted onto icons that were already waiting -- hymnography polished and a last pannikhida -- prayer service for the dead -- would be sung, and the patriarch would be venerated as an Orthodox saint. Then, when and as they deemed fit, the other Orthodox Churches would ratify the decision, driven by the love and veneration of their own congregations and at the discretion of the bishops. I'm neutral on Pope John Paul -- he seems to have been a good man, but I wouldn't presume to name another church's saint -- but it seems a shame to twist the definition of a perfectly good word into meaninglessness in order to accomplish a goal that could be accomplished more honestly by acknowledging that the process is inadequate to cover the reality. AND FURTHERMORE (not an update -- it's not new information, just something I didn't think to say before): If you believe sacramental theology at all, don't all priests practice miracles at every Liturgy?